As of February, 2018, the cabin is 12 miles from Resort International, Catskills, a 200 acre Casino and Amusement Park , with gambling and out door parks and water slides at Exit 106 on Rout 17 West. The cabin is also 5 mi from Bethel Woods Performing Arts Center & Museum, 8 Miles from Monticello, Big M Gaming Casino, Nightclub entertainment, shopping, movies, restaurants. 2 mi to White Lake for dining, music, clubs, jet ski & Power Boat rentals. One mile from Lake Superior Park for boating, swimming and picnic tables, excellent for families. As of Feb 2018 The Resort World Catskills Casino & Hotel opened at exit 106, 10 min from the cabin, gaming and out door water park!! There is a 24 hour Walmart and Shoprite. Area is great for antiquing, biking and white water rafting on the Delaware 15 min away. Great for doing absolutely nothing too! If you want to go nowhere, cabin is quiet and a 5 minute walk from the Toronto Lake at the end of the road, just sit in the yard and read a book or sit in front of the fire & watch a movie. Dogs are welcome. I live and work on the Upper West side in Manhattan and enjoy renting my cabin year round, except in the coldest months of winter, depends on the temperatures! I am a freelancer so I can enjoy my cabin during the week when no one is renting it, I love it up there! The house is only 2 hours from Manhattan, 90 miles from the GW Bridge and a world away. 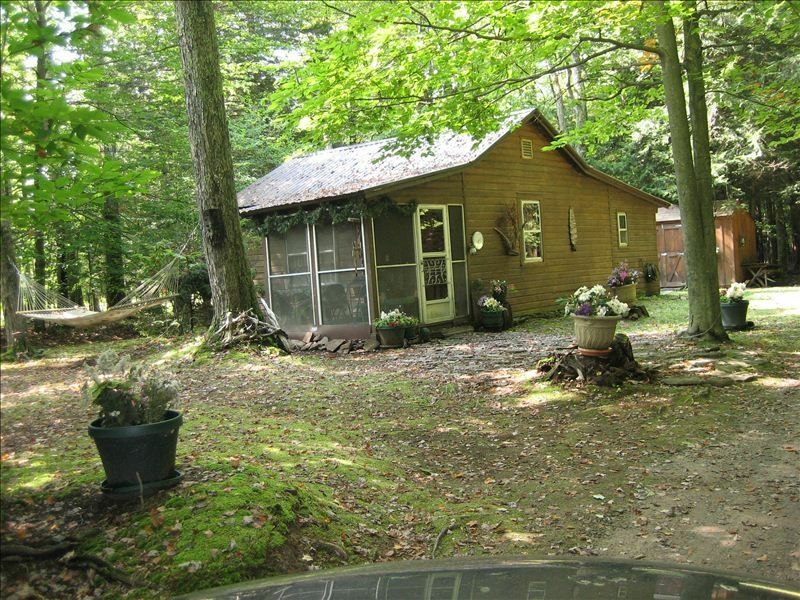 The cabin in situated in the center of 3 acres of woods surrounded by other wooded acres. There are no close neighbors and the lake at end of the road, such a short, beautiful walk, made it unique. I love kyaking and swimming and x-country skiing in the winter and this property for me was ideal. I know it will be the perfect choice for others who,like myself, want to get away without having to travel 3 or more hours. There is a major town nearby in Monticello if you need to do shopping or go to a movie or restaurant, but it's far enough away to be truly in the woods. The proximity of the other lakes in the area, Superior State Park, White Lake in town and Black Lake down the road make it a unique area for water sports. And now the cabin is a 5 minute drive to the Bethel Woods Music Shed and site of the 1969 Woodstock Celebration. The music festival is fantastic! and the new Woodstock Museum at the site is something you will see nowhere else, worth the trip from anywhere! Since February, 2018 it is 12 miles to the Resort International, Catskills site, 200 acres of casinos and water parks at exit 106 on Rt 17 West. Quiet road, secluded but not isolated location, short 5 minute walk to huge natural lake Toronto, great for swimming, kyaking, fishing or cross country skiing in winter. Hard to find this much wilderness only 90 miles from NY City! Out the windows you will see only Forest. There is a fence along the front of the property so you do not even see the road. Nearest neighbors are an acre away through the trees. Secluded and quiet. Lovely weekend in the woods! We enjoyed 2 nights of peace and quiet in this cozy cottage. Loretta was easy to communicate with and answered any questions we had. So close to Bethel Woods! Awesome time with my dog! My dog Hudson and I had an incredible time at Loretta’s cabin. We stayed for a week. Driving into the canopy of trees, with the sun’s rays shining through as you approach the cabin, was like entering paradise. It was an amazingly peaceful week. We didn’t want to leave! Glad to hear it, happy to know you enjoyed your stay. Loretta’s cottage was a fantastic immersion in the serenity of the Catskills for me and my little dogs. Loretta herself was a perfect hostess, generous, accommodating, and gave us total trust and privacy. The communication on the cabin was great. It was a rainy weekend so I was so happy to be in a cozy cabin and not camping. The host and cabin felt very welcoming and warm. It was perfect for our family and our dog. 8 miles from Monticello Raceway for Horse Racing and Casinos. Weekly craft fairs and red tag sales. 5 miles from Bethel Woods Arts and Music Festival Shed and 1969 Woodstock Site and Museum. 2 Kyaks with rental for Lake Toronto, 5 minute walk from cabin. 1 mile from Lake Superior Park for swimming, picnicking. boat rentals and pier fishing, 2 miles from White Lake, power boat and jet ski rentals. 2 miles from White Lake bars, restaurants and shops, 9 miles from Monticello Shoprite and Walmart for 24 hour shopping. 5 miles from Audobon Trail walks. 9 miles from Monticello Bus Depot for Shortline buses out of Port Authority in Manhattan, frequent scheduling year round, cabs available out front. 10 miles from major medical facility, Sullivan County Medical Center in Harris, NY. 1 mile from Fox's Service Station for car repairs. 15 minute drive to Delaware River for rafting, dining and Fort Delaware tours. Yearly Native American Festivals. Roebling Bridge, oldest bridge crossing in New York over to Pennsylvania only 15 minutes away. 1/2 hour to Port Jervis. and Route 96 that winds up and down the Delaware River, fabulous views and shops and restaurants. Narrowsburg Opera House and Theater only 15 minutes away, Forestberg Summer Playhouse only 20 minutes away with fabulous live performances. A short drive to many summer camps including Stage Door Manor. Lots to see, visit, do up here or sit in the yard and read a book in the hammock!